The commander of the U.S. Southern Command said al Qaeda raises “a lot of money” by allowing Latin American drug cartels to traffic cocaine into Europe through West Africa, explicitly associating the two enterprises. “We know that the cocaine that flows out of Bolivia and Peru, the number one and number two producer, feeds the cocaine habit around the world,” said U.S. Marine Gen. John Kelly, commander of Southcom, during an October 7 speech delivered to an audience at the National Defense University in Washington, D.C.
Al Qaeda in the Islamic Maghreb, which has been officially designated a terrorist organization by the U.S., operates in West Africa. France’s version of the DEA claims that Latin American cartel operations in West Africa are “literally funding al Qaeda,” according to Gen. Kelly. The global trafficking side of the illicit drug trade is being carried out by international organizations such as the Sinaloa and Zetas Mexican cartels. “Sydney, Australia is awash in cocaine as the expression goes. So is New Zealand,” explained the general. 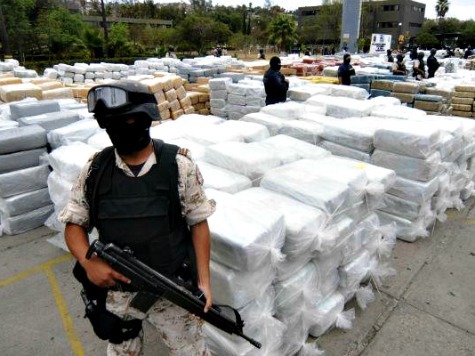 “There is cocaine being sold on the streets of Beijing and all of this, in one way or another, is handled by what are now international businesses called cartels — Sinaloa, Zeta, things like that. So the whole world is connected in terms of illicit trafficking of everything.